The ship will house a total of five officers and 45 sailors. Kolkata: The Indian Navy has commissioned a Landing Craft Utility (LCU) ship at Port Blair. 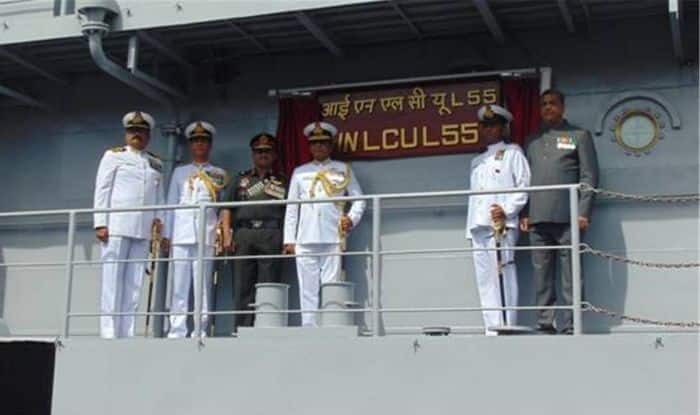 The ship, named ‘L-55’, was built indigenously by the Garden Reach Shipbuilders and Engineers Limited (GRSE) in Kolkata and was commissioned by Vice Admiral Ajit Kumar, Vice Chief of Naval Staff, reported Zee News. The ceremony was attended by the Rear Admiral VK Saxena, (Retd), Chairman and Managing Director, Garden Reach Shipbuilders and Engineers Limited (GRSE) besides other senior Navy and GRSE officials. The Mark IV LCU vessel is an improved version of the Mark III LCU vessel which is part of the fleet. This is the fifth Mark IV CU vessel – the first IN LCU L-51 was commissioned in March of 2017. The ship is likely to be based out of Navy’s Andaman and Nicobar Command. The primary role of the ship will be transportation and deployment of battle tanks, armoured vehicles and troops to the shore. It could also be deployed for Humanitarian Assistance and Disaster Relief operations. Two guns have also been installed to provide artillery fire support while the ship is fitted with state-of-the-art equipment and advanced systems like Integrated Bridge System and the Integrated Platform Management System. “These amphibious warships, developed by GRSE’s in-house design team, are unique in their design and operations, having a length of 62.8 metres and capable of achieving a speed of 15 knots with a low draught of 1.8 M. This once again proves GRSE’s ability to provide end-to-end solutions to their customers ranging from product conceptualization, design, system integration and project management, thereby enhancing the capability to meet customer demands,” added the release. The ship will house a total of five officers and 45 sailors. GRSE is completing the order for eight Landing Craft Utility (LCU) ships. The remaining three ships of the total eight are in advanced stages of construction and are expected to be delivered over the next one year.